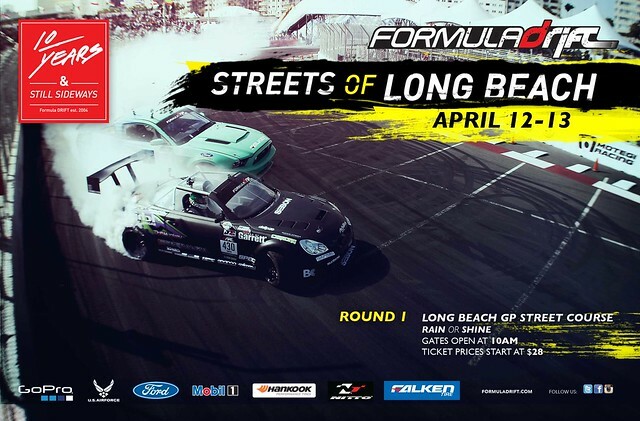 Round 1: Streets of Long Beach kicks-off the 2013 Championship season in style with new cars, new drivers, and all the sideways excitement that Formula DRIFT is known for. Champion Daigo Saito will be back to defend his title against all competitors including Vaughn Gittin Jr., Justin Pawlak, Ryan Tuerck, Fredric Aasbo and the rest of the talented pool of drivers. CLICK HERE AND ENTER THE CODE K1SPEED TO RECEIVE A SPECIAL TICKET OFFER! Don’t forget to the visit the K1 Speed booth to receive special discounts and photo op with show kart and K1 girls. Visit our partners, Falken Tire, and root on Justin Pawlak, Daijiro Yoshihara and Darren McNamara!